Tungsten carbide roller has characteristics of good wear resistance, high temperature red hardness, thermal fatigue resistance and thermal conductivity and high strength , have been widely used in high-speed wire rod, bar, rebar, seamless steel tubes, etc. 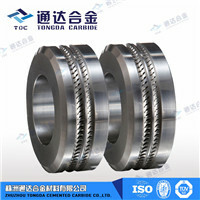 Domestic production of tungsten carbide roller materials mostly WC- Co, WC- Co- Ni- Cr two series, and the content of Co, Co- Ni - Cr is in the range of 6wt% ~ 30wt%. From the use of perspective, tungsten carbide rollers has good mechanical properties, its flexural strength up to 2200 MPa or more, shock toughness up (4 ~ 6) × 10^6 J/ m^2, Rockwell hardness (HRA) is up to 78 to 90, widely in the high-speed wire rod rolling process, which is much higher than single-slot chilled cast steel or high speed steel rolls.